When you want to create a garden or landscape that is eco-friendly the idea is quite simple – use plants in your garden that occurs in Southern Africa that is adapted to your local conditions. Ideally, one should use endemic plants, that is, plants that occur naturally in the surrounding areas. In this regard, we really live in an extraordinary and exciting environment where two major plant communities overlap. To understand the implications from a gardening perspective more clearly, let me introduce the concept of Biomes. A biome is defined as an area where the vegetation is fairly uniform and adapted to that particular environment. Most of us have a natural “feeling” for this – we talk about the Bushveld, the Karoo, Fynbos etc. Let us look briefly at some of these plant communities or biomes. 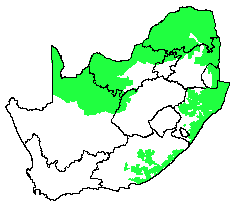 The Grassland Biome is found chiefly on the high central plateau of South Africa, and the inland areas of KwaZuluNatal and the Eastern Cape. The topography is mainly flat and rolling, but includes the escarpment itself. Altitude varies from near sea level to 2 850 m above sea level. In the grasslands, trees are virtually absent, except in a few localized habitats. Bulbs and other plants with an underground rootstock are often abundant. Frosts, fire and grazing maintain the grass dominance and prevent the establishment of trees. 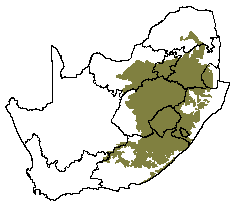 The Savanna Biome is the largest Biome, occupying over one-third the area of South Africa. lt is well developed over the Lowveld and Kalahari region of South Africa and is also the dominant vegetation in Botswana, Namibia and Zimbabwe. It is characterized by a grassy ground layer with disjunct scattered trees or shrubs. The local vegetation may be known as Shrubveld, Woodland or Bushveld depending on the dominant upper layer. Most of the Savannah plants survive fire, drought and grazing and are therefore also well adapted to gardening conditions. In our area, the Grassland Biome and the Savannah Biome meet. This implies that many plants from both these biomes are well adapted to our environment. Where such major plant types meet, other interesting phenomena also occur. There are plants that only occur in this transitional area and nowhere else. In our case, the most widely known is Aloe peglerae that is endemic to the Magaliesberg. In practice, it has also been found that plants from the Thicket Biome from the Eastern Cape are also very well adapted to highveld gardening conditions. Obviously, many other environmental factors should be considered before you choose plants for your garden, such as soil type, temperature, aspect and so on, but at least the basket is enormous. There are many plants from the three Biomes that can be grown in our area. What must be borne in mind is that local climate can vary considerably and must be taken into account when plants are selected. For instance, in the central valley south of the Magaliesberg frost can be severe, whereas only three kilometers away at the slopes of the mountain, frost is a rarity. Endemic plants that are well adapted to gardening conditions are the corkbush, Mundulea sericea, common hook thorn, Acacia caffra and the beauty of early spring, the wild pear Dombeya rotundifolia. You can use the Advanced Search Facility to find plants that are suited to your highveld or bushveld garden. Use the Habitat field and enter the biome you’re interested in. Enter only one biome at a time. For example: grassland or savanna. Not all plants in the Indigenous Plant Database are commercially available. And many plants are only available at certain times of the year. Enter Yes in the Grown by Wildflower Nursery in the Advanced Search Facility to filter for those that are grown. PlantZAfrica also has a search facility.